AJL Roadmarking are Car Park Marking specialists and we can advise on and install markings to help maximise parking availability with a carefully planned line marking programme to organise traffic flow and parking positions. We can refresh old road markings for a cost-effective face lift to existing parking areas. The parking area to your premises will often be your opportunity to give a prospective client a good first impression of your business. Our crews will work outside of normal working hours to minimise inconvenience if requested. 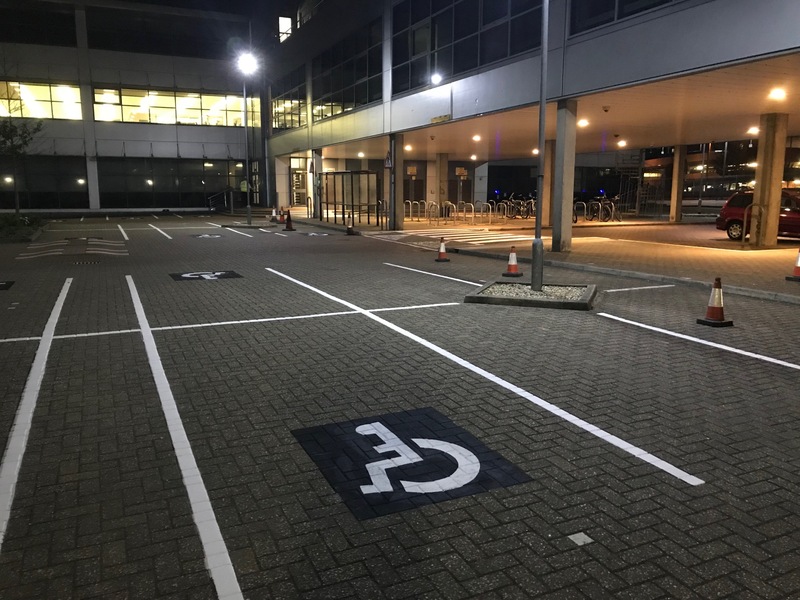 Create a safe environment for both staff and customers with line markings to create pedestrian walkways, zebra crossings,disabled or parent and child parking. Our 2 estimators have nearly 20 years of road marking experience between them and are happy to advise to help you make the most of the space you have. AJL Roadmarking can supply cost effective line marking solutions to suit any surface or environment with a choice of cold paints, hot applied Thermoplastic or ultra hard wearing Methyl Methacrylate.